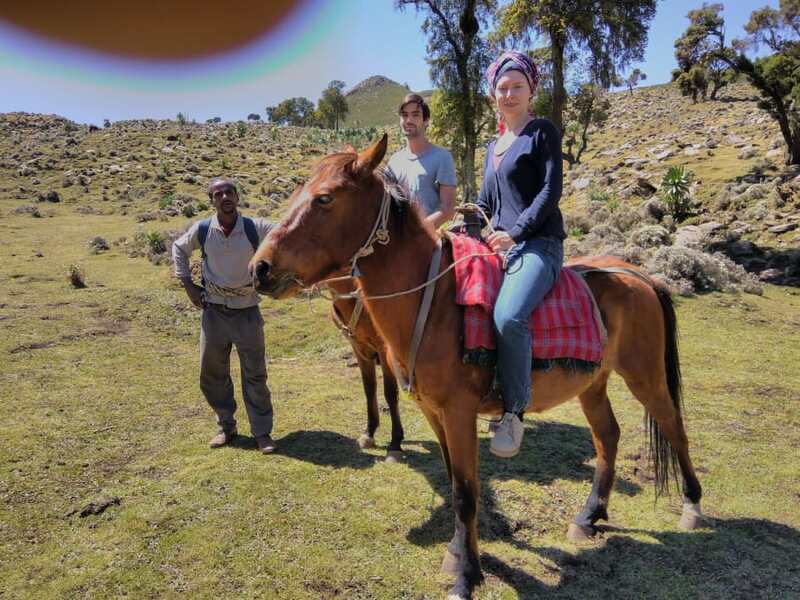 Freezing temperatures near the equator, disappearing horses, awkward clothing and other things we did not expect during our epic horse riding in Ethiopia. 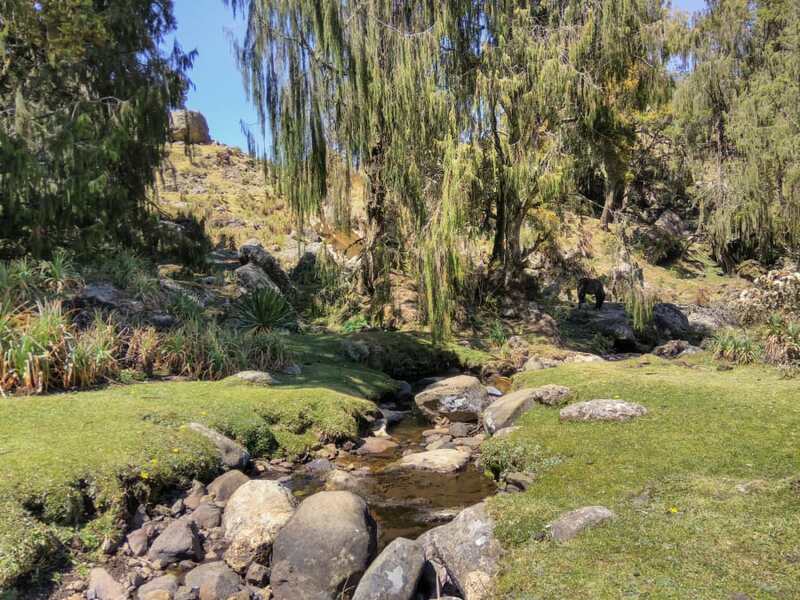 This is the third part of a seven-part-long story about a week spent in the Bale mountains. Read the first here. The day started with a surprise: we had one horse less, but one extra cook! Our guide stated that he didn´t order a horse for himself and from now until the end of the trip he would walk with the handlers. We guessed that he saved some money that way he would otherwise have paid for the horse. For us, that would mean we couldn’t go any faster than the walking delegation. The walking group now consisted of a handler, our guide and the cook we had met the day before – at first, we thought that he was just walking in the same direction, but he stayed with us till the very end. Well, we still tried to use some good parts of the path in the morning to trot, and then waited for the rest of the group when the path split or became unrecognizable. However, after the first two hours, the path became very stony and was framed on either side by thick bushes which didn`t allow our horses to take an extra step to the right or to the left. We were trapped like a car in the brushes of a carwash – except quite a few of these had thorns. Going faster than walking didn´t feel right anyway. We were really high up into the mountains now – at about 3400 m. The sun was burning mercilessly. Even using an SPF 60 sunscreen I managed to burn my neck and my hands. (My hands were fixed in the same position by holding the reins) Unpacking a scarf and my winter gloves was the only choice. Balti got a beautiful scarf with a pattern of pink roses to cover his neck. He was a bit worried whether his style would be well received in this part of the world. But there was nobody on our way to question his masculinity except for a shepherd we met on a meadow we stopped at for lunch. 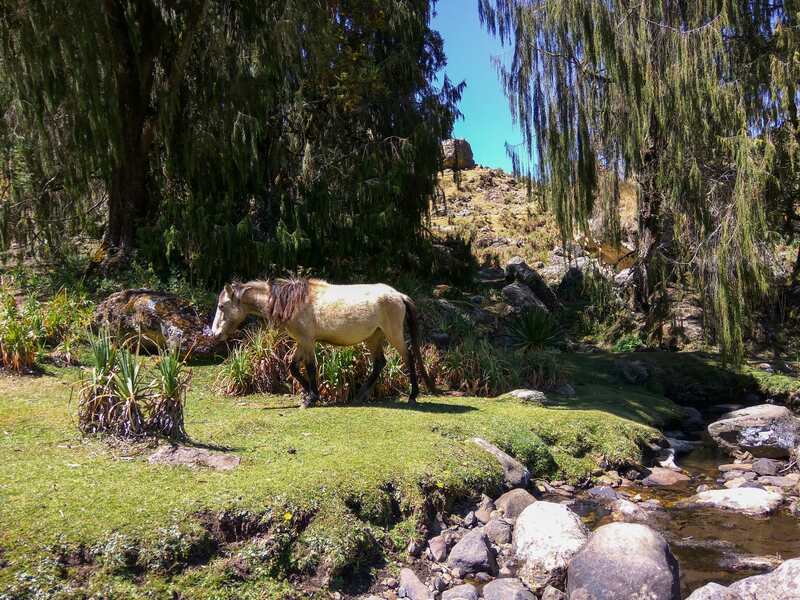 The lunch place was stunning: a stream, a green meadow and some sheep and horses on the pasture. We didn’t want to leave! Here is a picture of us taken during a break, after we got onto the horses. We absolutely love it as it precisely portrays what was happening on the second day of our ride. The cook jumped into the picture in the last second without warning and our guide (who took the picture) does some shady businesses. We never asked to take another picture. It simply could not be better. The riding gear was troubling us again on that day. The wooden saddle was now harder to ignore at the end of the second day of the trail. That day my stirrups were too short as well. After a while, I just took my feet out. Though, it was important to stay focused and to balance while the horse was jumping from one big stone to another. When we arrived at the second base camp, we were surprised to find only one hut made of corrugated metal. Sleeping in the hut together with our guide and the cook didn’t seem so appealing to us. But the thought of them, sleeping outside, was not appealing to us either. The second basecamp was at the greatest altitude out of all of the camps, we imagined it would become freezing cold that night. After our inquiry, it was clear what the arrangements were supposed to be: the hut was designated for us and the two of them were supposed to sleep in the hut with the fireplace which had walls made of scattered wood sticks and no roof to speak of. It was clearly time for us to pitch our tent and let them sleep in the hut. We got a couple of blankets and were happy with the final sleeping arrangements. As I expected it got really cold after the sun had set. While sitting by the fire, one side of me was being roasted while the opposite side was freezing. Have you ever had this experience? We had a great view from our tent! 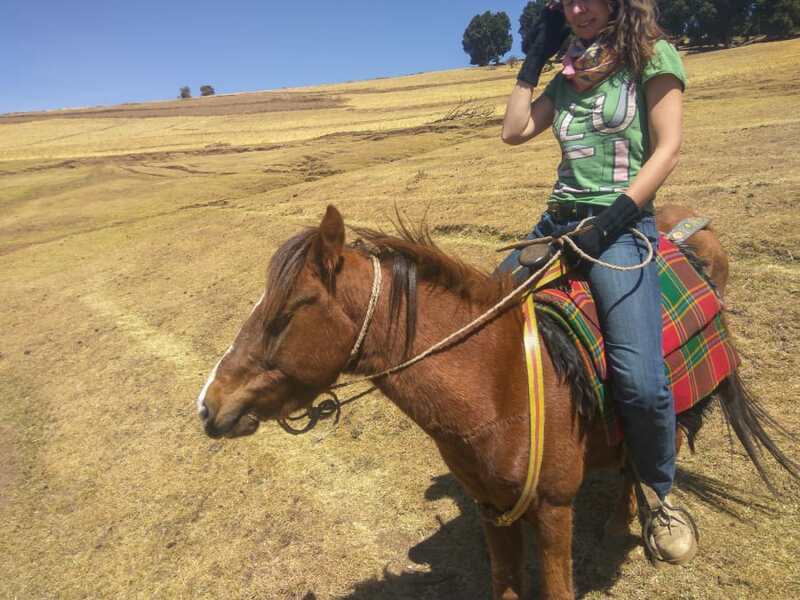 Find out more about the Bale Mountains and riding in Ethiopia in the next post. 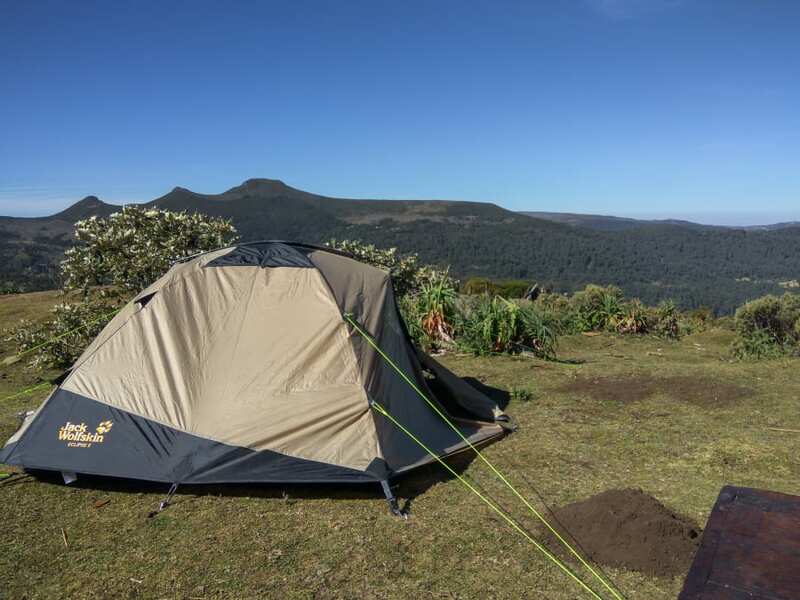 Next PostNext What Food to Take Camping in Ethiopia?